Text input - keyboard, S Pen or something else? The Samsung Galaxy Note II comes with several text input options. Yes, there is handwriting recognition using the S Pen, but even the standard on-screen QWERTY has several different options. The big screen makes for a comfortable portrait typing, and we really appreciate the extra row just for the numbers. Two finger typing is comfortable on the Note II in portrait mode, but becomes a pain in landscape. The landscape QWERTY also obscures too much of the screen, so we ended up sticking to portrait orientation for text input. Here are a handful of clever tricks that this keyboard can offer. You can swipe left and right on the keyboard to position the cursor. Okay, this isn't new but this is - you can hover over a text field with the S Pen and a cursor appears. You have to tap to position it there. You can also enable "Continuous input", which lets you input words by swiping over the keyboard (yes, like Swype). This is available on the Galaxy S III too. Then we move on to handwriting recognition. It's very accurate (even with our awful penmanship) and the thicker, longer S Pen helps quite a bit to improve the experience. The Samsung Galaxy Note II has very advanced text prediction features to eradicate typos. If you allow it, it will scan through your emails, Facebook posts and Twitter posts and learn how you write (which words you use more often and so on). We move on to the non-keyboard text input methods. You can, of course, use voice input and since the Galaxy Note II is running Android 4.1 Jelly Bean, this will work even if the phablet is offline as long as you have downloaded the required language package. Finally, there's the camera - yes, the camera. You can snap a photo of text and the Galaxy Note II will run OCR on it and enter it automatically. The great thing about this is that you don't need an Internet connection for this either. You can fit an entire A4 page and the Note II will transcribe it in a matter of seconds. You'll need to proof-read the text though. By the way, the Galaxy Note II is smart about picking which text input method to show you. If you tap a field with you finger, it will bring up the QWERTY keyboard. If you tap a field with the S Pen instead, it will launch the handwriting recognition. 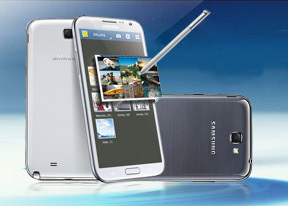 The Samsung Galaxy Note II is powered by a homebrewed chipset - Exynos 4412 Quad. It has a quartet of Cortex-A9 cores clocked at 1.6GHz along with 2GB of RAM and Mali-400 GPU. We'll hold off on the analysis of the benchmarks, we think the results speak for themselves. A quick note about the GPU benchmarks - all phones here besides the Meizu have a 720p screen, while MX 4-core has a qHD screen. The benchmarks on the Galaxy Note II were run in the native browser in Android Jelly Bean - it's blazing fast! The others were run with Chrome on Ice Cream Sandwich, which is faster than the stock ICS browser.